The Management-Manager/Supervisor program prepares individuals to seek employment or advancement in business, industry, government or service organizations. The Manager-Supervisor program develops the cognitive, problem solving, human relations, and technological skills that are necessary in operating the new design system for today’s global economy. This program has been articulated with some area high schools. Recent high school graduates may have earned credit in this program through high school coursework. Refer to page 31 for more information. 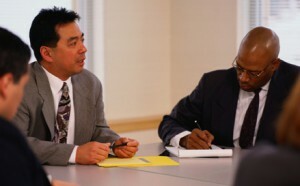 The mission of the Manager/Supervisor program at South Suburban College is to meet the needs of individuals to effectively function within a modern business environment, as it relates to understanding positions in the field of supervisor or manager. Students are also able to prepare for program specific certifications. To provide students with a clear understanding of communication, human relations, critical thinking and problem solving skills required to effectively supervise/manage within the business environment. Students will be better prepared to enter into a four year university or increase their job opportunities. understand the principles of management involved in managing people, products, and/or services. develop interpersonal and human relations skills required to interact and motivate staff for positive business outcomes. develop critical thinking and problem-solving skills directly related to positions in management. gain valuable on-the-job work experience in the field of supervisor/manager by completing an internship within a professional office environment. This certificate is an accelerated program of marketing studies designed to qualify people for entry level work or promotion within the shortest possible time. This program has been articulated with some area high schools. Recent high school graduates may have earned credit in this program through high school coursework. South Suburban College offers a variety of basic certificates designed to provide specialized training in specific areas. The following basic certificate is designed for men and women who need basic employment skills. This certificate is designed for men and women who plan to operate their own business by gaining a foundation of knowledge that will assist in the development of a Business Plan.